African print shirt (previously worn Here )//H&M shorts ( previously worn Here )// Versace sunglasses & belt// Valentino watch// Jewelry- Macys & Dubai// Mide-Miro purse. 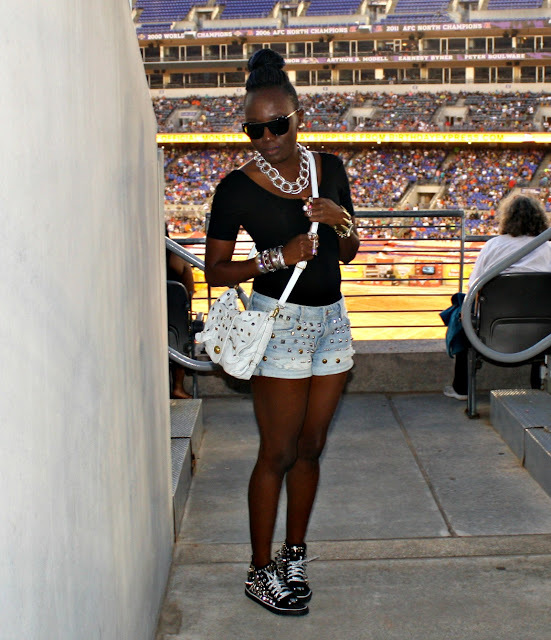 F21 bodysuit// DIY shorts (Previously worn Here)//DIY shoes (previously worn Here)// LA boutique purse//Vogue sunglasses//MK watch//jewelry-Macys, NY vendor, Dubai. i love those shorts, they are amazing! What a great show! i love the printed shirt and the studded shorts!! 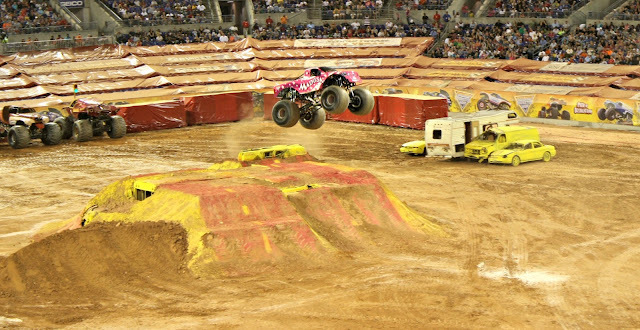 That's a blast from my past - I remember Monster Trucks at Joe Louis Arena in Detroit. I bet you guys were the most stylish people at this event! Love all those studs and the printed shirt is amazing! Great show! amazing looks! it fits to the monsters truck! 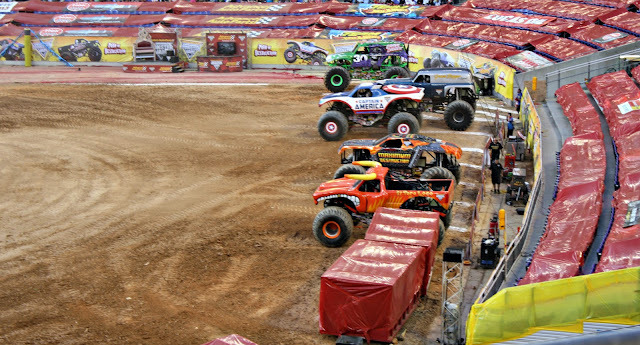 You guys looked too fab for monster truck rally...heehee...love it! omg. id die. i want to go to a monster truck rally too!!!!!!! you two look nice, i like your outfits! cool hair! Those shorts and sneakers are so Cool! haha i absolutely love this!! i am sure you were by far the most fashionable ladies at this event! Wow, this event is so great! great event hope you ladies had a lot of fun !!! I've just seen that in movies! Did you enjoy it? 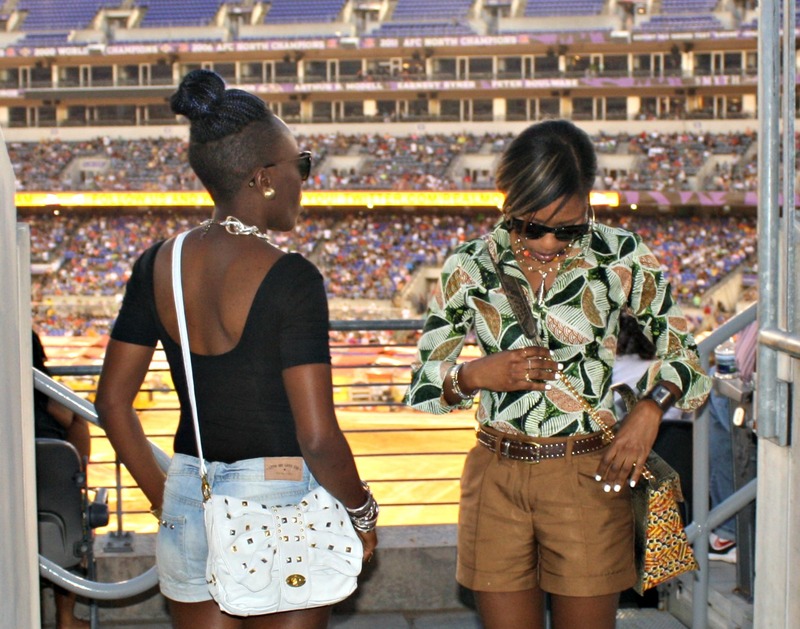 And I really like that african print shirt --it really stands out, and looks great with the shorts! You always look so chic and put together. Amazing styles. you guys have such different and unique styles! 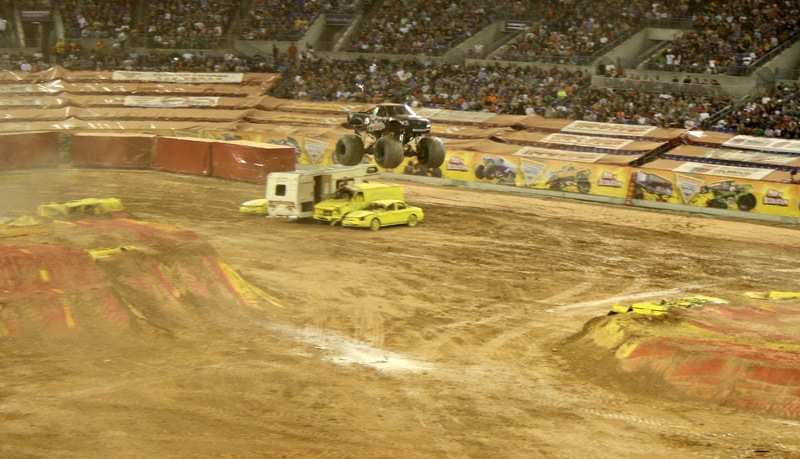 when i was little my dad used to take me to monster truck shows too, great meemories! 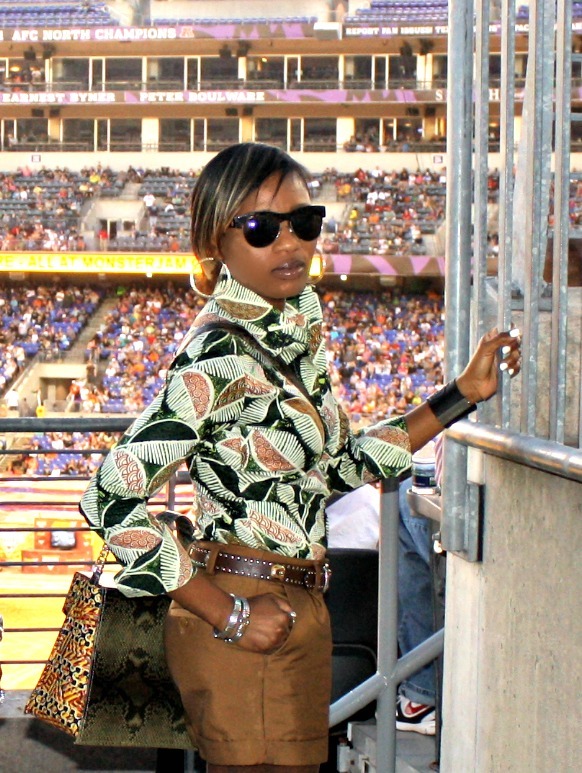 and i love this african print bluse!!! really fabulous! Ladies thanks for you visit and for following me!! Following you too!! BTW nice looks!! 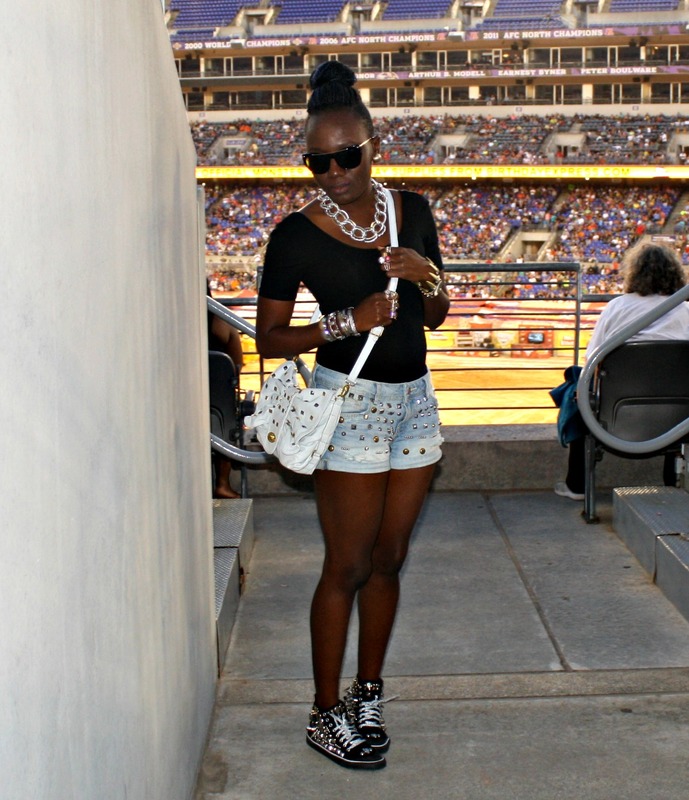 The studded shorts are great with the studded purse! The African Print shirt really appeals to me. It has the "global" look that everyone is after! Question: Who's Fifth and who's Sixth? Ah, LOOOOOVE all the studs in that outfit! Those sneakers are sooo fun! Dying to do a DIY of them! Loving the African print blouse too! Great print!! You guys have such a nice styles! I’ve just wrote a new post, tell me what do you think about it! both of ya look so fabulous i love both shorts and i love ur brown blouse and the white crossbody is so cute! Great looks! really love your style! Love that shirt, has great pattern! It´s incredible your style and great ideas! I can't get enough of your style ladies!! You look great. OMG I love those studded kicks! Super cute outfits, love your style ladies. Of course you two wonderful fashionistas could take dainty personal style to a "manly event" and make it all work. You look great!